A dedicated UNC45, Cro1, She4 (UCS) domain-containing protein assists in the Hsp90-mediated folding of the myosin head. Only weak sequence conservation exists between the single UCS protein of simple eukaryotes (She4 in budding yeast) and the two UCS proteins of higher organisms (the general cell and striated muscle UNC45s; UNC45-GC and UNC45-SM, respectively). In vertebrates, UNC45-GC facilitates cytoskeletal functions, whereas the 55% identical UNC45-SM assists assembly of the contractile apparatus of cardiac and skeletal muscles. A Saccharomyces cerevisiae she4Δ mutant, totally lacking any UCS protein, was engineered to express as its sole Hsp90 either the Hsp90α or the Hsp90β isoforms of human cytosolic Hsp90. A transient induction of the human UNC45-GC, but not UNC45-SM, could rescue the defective endocytosis in these she4Δ cells at 39 °C, irrespective of whether they possessed Hsp90α or Hsp90β. UNC45-GC-mediated rescue of the localisation of a Myo5-green fluorescent protein (GFP) fusion to cortical patches at 39 °C was more efficient in the yeast containing Hsp90α, though this may relate to more efficient functioning of Hsp90α as compared to Hsp90β in these strains. Furthermore, inducible expression of UNC45-GC, but not UNC45-SM, could partially rescue survival at a more extreme temperature (45 °C) that normally causes she4Δ mutant yeast cells to lyse. The results indicate that UCS protein function has been most conserved—yeast to man—in the UNC45-GC, not UNC45-SM. This may reflect UNC45-GC being the vertebrate UCS protein that assists formation of the actomyosin complexes needed for cytokinesis, cell morphological change, and organelle trafficking—events also facilitated by the myosins in yeast. The UCS (UNC45, Cro1, She4) domain-containing protein function was first identified from the study of Caenorhabditis elegans UNC-45 (“UNCoordinated”) mutants. These display defects in motility (Barral et al. 1998; Ao and Pilgrim 2000) and cytokinesis during embryogenesis (Kachur et al. 2004). The single C. elegans UNC45 protein was found to associate with both Hsp90 and myosin (Barral et al. 2002); facilitating not just myosin folding but also the regulation of myosin levels by targeting excess or damaged myosin to the proteasome for degradation (Landsverk et al. 2007). It is now recognised that UCS proteins assist in the Hsp90-mediated folding of the head region of both conventional and nonconventional myosins, as well as the associations of these myosins with actin filaments. She4, the nonessential UCS protein of budding yeast (Saccharomyces cerevisiae) interacts with the S. cerevisiae class I myosins (Myo3 and Myo5) in a temperature-dependent manner (Toi et al. 2003; Wesche et al. 2003), thereby facilitating actin cytoskeleton polarisation, endocytosis (Wendland et al. 1996) and the asymmetric mRNA localisation of ASH1 mRNA to daughter cells (Long et al. 1997). Rng3, the corresponding UCS protein of fission yeast (Schizosaccharomyces pombe) interacts with both Hsp90 (Mishra et al. 2005) and the class II myosin Myo2 (Lord and Pollard 2004; Mishra et al. 2005), increasing the affinity of myosin II for actin filaments (Lord et al. 2008). S. pombe RNG3 mutants show a 10-fold decrease in Myo5 levels, a fourfold decrease in cortical actin patches (Lord et al. 2008) and defective cytokinesis (Wong et al. 2000). While fungi and worms have just a single UCS protein, vertebrates have two, a general cell form (UNC45-GC or Unc-45A)—expressed in most somatic cells—and a striated muscle form (UNC45-SM or Unc-45B)—highly expressed only in heart and skeletal muscle (Hutagalung et al. 2002; Price et al. 2002). These UNC45s are not functionally redundant (Comyn and Pilgrim 2012). UNC45-GC assists in the cytoskeletal functions in most cells whereas UNC45-SM has a more specific role in the assembly of the contractile apparatus of cardiac and skeletal muscles (reviewed in (Lee et al. 2014; Ni and Odunuga 2015)). Furthermore UNC45-GC interacts preferentially with the Hsp90β, not Hsp90α isoform of the human cytosolic Hsp90 (Chadli et al. 2008; Taipale et al. 2014). In contrast UNC45-SM appears to associate with both Hsp90α and Hsp90β (Etard et al. 2007; Taipale et al. 2014). It is the characteristic C-terminal UCS domain of UCS proteins that facilitates binding of the myosin motor domain to actin filaments and the prevention of myosin aggregation (Shi and Blobel 2010). UCS proteins also possess a central domain of unknown function and—in the case of the vertebrate and worm, but not fungal UCS proteins—an N-terminal tetratricopeptide (TPR) repeat. Strong indications of how the UCS domain facilitates the association of the myosin head with its actin filament binding site have emerged from the atomic structure of the yeast She4 dimer (Shi and Blobel 2010). In addition, the C. elegans UNC45 has been shown to form linear multimers, a filament assembly scaffold that directly couples myosin folding with the formation of myofilaments and the organisation of sarcomeric repeats (Gazda et al. 2013). There is only limited sequence conservation between the UCS proteins found in yeasts and higher eukaryotes (Gómez Escalante et al. 2017). We therefore investigated whether the human UNC45-GC and UNC45-SM are still able to provide UCS protein function in yeast. This report describes our analysis of whether a heterologous expression of these two human UCS proteins can rescue the defective type 1 myosin localisation, defective endocytosis and high temperature lysis defects of the S. cerevisiae she4Δ mutant. It also exploited she4Δ yeast strains lacking the native Hsp90 in which the essential Hsp90 function is provided by either the Hsp90α or Hsp90β isoform of human cytosolic Hsp90. This was to extend the investigation to a study of whether it is possible to reproduce in this simple model organism the apparent selectivity of the human UNC45-GC for Hsp90β (Chadli et al. 2008; Taipale et al. 2014). PP30she4∆ MYO5-GFP [pHSC82] was generated by hphMX4 cassette (Goldstein and McCusker 1999) deletion of SHE4 gene sequences in PP30 (MATa trp1-289 leu2-3112 his3-200 ura3-52 ade2-101oc lys2-801am hsc82ΔkanMX4 hsp82ΔkanMX4 [pHSC82] (Panaretou et al. 1998)); then C-terminal tagging of the MYO5 gene with green fluorescent protein (GFP) using a HIS3 gene cassette generated from pUG23 (Niedenthal et al. 1996). This strain has deletions of the chromosomal Hsp90 genes, but it is viable since it carries an Hsp90 gene (HSC82) on a URA3 plasmid. By exchanging this URA3 vector for a LEU2 plasmid, three different versions of this strain—identical but for the HSC82 promoter-directed Hsp90 gene carried on the latter LEU2 vector—were constructed, as previously described (Millson et al. 2007). These were genes encoding either the Hsp82 isoform of the Hsp90 native to yeast (strain PP30she4∆ [Hsp82]), the human Hsp90α (strain PP30she4∆ [Hsp90α]) or the human Hsp90β (strain PP30she4∆ [Hsp90β]). UNC45-GC and UNC45-SM were first amplified by PCR from cDNAs supplied as Image clones (5534906 and 40008187, respectively, from Geneservice, Cambridge, UK) using primers Hgc45F/Hgc45r and Hsm45F/Hsm45R (Table 1), respectively. In a second PCR, a 6xHis tag was added at the N-terminus of the coding sequence using primers Hgc45his6F/Hgc45r for UNC45-GC and Hsm45hisF/Hsm45R UNC45-SM. Similarly, a 6xHis tag was added at the N-terminus of the coding sequence of yeast SHE4 gene by PCR amplification from a pRSETA clone of SHE4 using primers HisShe4F/She4R (Table 1). All three 6xHis tagged genes were then cloned into the vector pCR®-XL-TOPO® (Invitrogen), their sequences being confirmed by terminator dye sequencing. The inserts of these pCR®-XL-TOPO-based plasmids were first inserted into the centromeric plasmid vector pShep (Gómez Escalante et al. 2017), generating vectors for their expression under the control of the promoter and terminator sequences of the yeast SHE4 gene. Next, they were inserted into the yeast expression vector pYES2.1/V5-His-TOPO® (Invitrogen), generating vectors for their GAL1 promoter-driven overexpression in yeast. These plasmids were inserted into the above she4∆ strains, selecting for growth on 2% glucose minus uracil dropout medium. Levels of expression were analysed by growing cells on 2% galactose to allow induction of protein expression, then western blot analysis with an anti-his antibody (Qiagen). Conditions for the preincubation of cells with FM4-64 (a fluorescent lipophilic styryl dye that is normally rapidly internalised by endocytosis in budding yeast and then targeted to the vacuolar membrane (Smythe and Ayscough 2006)); the subsequent analysis of cells by fluorescence microscopy; also heat survival experiments were exactly as reported for a previous study (Gómez Escalante et al. 2017). This study sought to determine whether UNC45-GC and UNC45-SM are functional in yeast; also whether it is possible to reproduce in this model organism the apparent selectivity of the human UNC45-GC for Hsp90β rather than Hsp90α (Chadli et al. 2008; Taipale et al. 2014). For this purpose we constructed yeast strains that lack the single, nonessential UCS protein of S. cerevisiae (She4) in which Hsp90 chaperone function is provided by one of three discrete forms of Hsp90; either a Hsp90 native to yeast (Hsp82), the human Hsp90α or the human Hsp90β (strains PP30she4∆ [Hsp82], PP30she4∆ [Hsp90α] and PP30she4∆ [Hsp90β], respectively; see Methods). In addition, Myo5—one of the two class I myosins of overlapping function in S. cerevisiae (Myo3/5)(Goodson et al. 1996)—was GFP tagged in these she4Δ strains, the encoded Myo5-GFP fusion being a functional form of myosin (Gómez Escalante et al. 2017). Initially, we inserted into strains PP30she4∆ [Hsp90α] and PP30she4Δ [HSP90β] single copy genes for 6xHis-tagged forms of UNC45-GC and UNC45-SM. These had been placed under the control of the promoter and terminator sequences of the native SHE4 gene as inserts within the single copy (centromeric) URA3 plasmid vector pShep (Gómez Escalante et al. 2017). We also inserted into these two strains, as a control, pShep vector lacking any gene insert. She4 is especially important for the functioning of class I myosins in yeast cells subjected to stress, since phenotypes of the she4Δ mutant are most readily detectable at high temperature (Goodson et al. 1996; Toi et al. 2003; Wesche et al. 2003). Functionality of the single copy 6xHis-UNC45-GC and 6xHis-UNC45-SM genes in these she4Δ MYO5-GFP transformants was therefore studied as their ability to restore Myo5-GFP localisation to cortical patches at 39 °C, as well as localisation of the fluorescent dye FM4-64 to the vacuolar membrane at this temperature, as in our earlier study of mutant forms of the native She4 in yeast (Gómez Escalante et al. 2017). However we could not obtain convincing evidence that these single copy genes were rescuing these she4∆ phenotypes in PP30she4∆ [Hsp90α] and PP30she4Δ [HSP90β] (not shown). This is despite earlier finding that the native 6xHis-SHE4 gene on this same vector could restore She4 function in a she4Δ yeast mutant of a different genetic background (Gómez Escalante et al. 2017). On the assumption that these negative results might have reflected the heterologous UCS genes operating with suboptimal efficiency in yeast, we next investigated the effects of overexpressing 6xHis-UNC45-GC and 6xHis-UNC45-SM. pYES2.1-based vectors were constructed for a GAL1-promoter-driven overexpression of these 6xHis-tagged forms of UNC45-GC and UNC45-SM, also the native She4 protein (pYES2.1-UNC45-GC, pYES2.1-UNC45-SM and pYES2.1-SHE4; see Methods). Strains PP30she4Δ [HSP82], PP30she4∆ [Hsp90α] and PP30she4Δ [HSP90β] were transformed with these vectors for the overexpression of 6xHis-She4, 6xHis-UNC45-GC and 6xHis-UNC45-SM, as well as empty pYES2.1. Having confirmed that the former transformants were expressing a galactose-induced 6xHis-tagged protein of the correct size, cells were next grown on minus uracil glucose and galactose plates at 30 and 37 °C to determine whether the overexpression of 6xHis-She4, 6xHis-UNC45-GC and 6xHis-UNC45-SM would rescue the weak temperature sensitivity of these she4Δ transformants grown at 37 °C (Fig. 1a). Interestingly, the GAL1 promoter-directed induction of all three proteins appeared to be slightly detrimental for growth at high temperature (Fig. 1a). In C. elegans, overexpression of the native UNC45 has been shown to generate defects in myosin assembly, a decreased myosin content and a mild paralysis phenotype (Landsverk et al. 2007). Similarly, overexpression of UNC45-GC in ovarian cancer cells has been correlated with increases in cell motility and metastasis (Bazzaro et al. 2007). In our hands, overexpression of the native She4 (as 6xHis-She4) in she4Δ cells containing the native yeast Hsp90 (strain PP30she4Δ [HSP82]) not only failed to restore high temperature growth (Fig. 1a) but caused appreciable loss of the punctuate localisation of Myo5-GFP even at moderate temperature (Fig. 1b). At higher temperature (39 °C), it facilitated localisation of the fluorescent dye FM4-64 to the vacuolar membrane, yet caused a relatively inefficient rescue of the Myo5-GFP localisation to cortical patches (Fig. 1c and data not shown). Thus, overexpressing the native She4 in yeast generates mildly detrimental effects. These findings, together with those from other systems (Bazzaro et al. 2007; Landsverk et al. 2007), would appear to indicate that there is an optimal level for UCS protein expression in diverse cell systems. In view of these indications of an adverse effect of high UCS protein expression, we proceeded to analyse our pYES2.1-vector containing transformants after a transient 6xHis-UNC45-SM or 6xHis-UNC45-GC induction on galactose medium. As shown from the sample blot in Fig. 1d, protein expression from these pYES2.1-borne genes appeared optimal 6–8 h after 28 °C cultures had been transferred from glucose to galactose. Appreciable protein degradation was apparent with a 24 h induction (Fig. 1d). Therefore, it was cells induced 8 h at 28 °C on galactose minus uracil medium that were used in the subsequent microscopy of PP30she4∆ [Hsp90α] and PP30she4Δ [HSP90β] transformants containing pYES2.1-UNC45-GC and pYES2.1-UNC45-SM (Figs. 2 and 3). Cultures of PP30she4∆ [Hsp90α] and PP30she4Δ [HSP90β] containing either empty pYES2.1 vector, pYES2.1-UNC45-GC or pYES2.1-UNC45-SM were induced on galactose minus uracil medium for 8 h at 28 °C, then subjected to a 1 h 39 °C heat shock. As in our earlier study of mutant forms of the native She4 of yeast expressed in she4Δ MYO5-GFP cells (Gómez Escalante et al. 2017), functionality of the expressed 6xHis-UNC45-GC and 6xHis-UNC45-SM was analysed as their ability to rescue FM4-64 localisation to the vacuolar membrane and Myo5-GFP localisation to cortical patches at high temperature (39 °C). Prior to the heat shock Myo5-GFP was efficiently localised to cortical patches in all of the cultures (not shown). In the control cells containing empty pYES2.1: cells lacking any UCS protein and expressing either Hsp90α (Fig. 2) or Hsp90β (Fig. 3), this patch-like localisation of the Myo5-GFP was substantially lost at 39 °C, the Myo5-GFP becoming largely dispersed throughout the cytosol (Figs. 2 and 3). The prominent endocytosis defect in these she4Δ cells with empty pYES2.1 was apparent from the relatively weak FM4-64 staining of the vacuole at 39 °C, irrespective of whether such cells lacking a UCS protein expressed Hsp90α (Fig. 2) or Hsp90β (Fig. 3). With induced 6xHis-UNC45-SM expression, we obtained no rescue of either of these phenotypes in the she4Δ cells with Hsp90α (Fig. 2) or Hsp90β (Fig. 3). Instead, the mislocalisations of Myo5-GFP and FM4-64 at 39 °C appeared to be rendered more enhanced by this 6xHis-UNC45-SM expression, especially in those cells that contained Hsp90α (Fig. 2). In contrast, with induced 6xHis-UNC45-GC expression there was a substantial rescue of the defective she4Δ cell endocytosis at 39 °C, irrespective of whether the cells contained the human Hsp90α (Fig. 2) or the human Hsp90β (Fig. 3). The corresponding rescue of Myo5-GFP localisation to cortical patches was much more prominent in the cells containing Hsp90α (Fig. 2) as compared to those that contained Hsp90β (Fig. 3). This latter effect may merely be a reflection of the apparent greater functionality of the Hsp90α isoform of human Hsp90 as compared to Hsp90β noted earlier for in cells of this yeast genetic background (Millson et al. 2007). 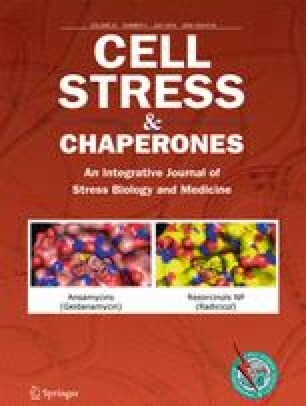 The apparent selectivity of UNC45-GC for association with Hsp90β rather than Hsp90α in human cell extracts (Chadli et al. 2008; Taipale et al. 2014) was not reproduced in the ability of UNC45-GC to rescue she4Δ phenotypes this in vivo model system, since such rescue was more evident in the yeast containing—as its sole Hsp90—the human Hsp90α (Fig. 2). At the more stressful temperature of 45 °C, she4Δ cells undergo lysis, thereby losing viability much more rapidly than cells with a functional She4 protein (Gómez Escalante et al. 2017). We found that an induced 6xHis-UNC45-GC expression could partially restore viability to PP30she4∆ [pHsp82] subjected to such high temperature stress, though not to the same degree as the native She4 (Fig. 4). In contrast, the corresponding expression of 6xHis-UNC45-SM appeared to be somewhat detrimental for this survival (Fig. 4). This is yet further evidence that UNC45-GC has a degree of functionality in yeast. This study sought to determine whether heterologous expressions of the two human UCS proteins, UNC45-GC and UNC45-SM, can provide UCS protein function in yeast; also whether it is possible to reproduce in this model organism any apparent selectivity of UNC45-GC for Hsp90β rather than Hsp90α (Chadli et al. 2008; Taipale et al. 2014), Hsp90α and Hsp90β being the two isoforms of vertebrate cytosolic Hsp90. It exploited she4Δ yeast strains in which the sole, essential Hsp90 is either the native yeast Hsp82, the human Hsp90α or the human Hsp90β. Appreciable rescue of the defective endocytosis in she4Δ cells at 39 °C was only apparent with expression of UNC45-GC, not UNC45-SM (Figs. 2 and 3). Furthermore, it occurred irrespective of whether the yeast cells possessed—as their sole Hsp90—the human Hsp90α or Hsp90β. Induction of UNC45-GC, but not UNC45-SM, could restore type 1 myosin localisation, though this effect was more marked in the yeast containing Hsp90α rather than Hsp90β (Figs. 2 and 3). This rescue of UCS protein functions required a transient overexpression of UNC45-GC, our initial efforts to obtain rescue with a single copy UNC45-GC gene placed under the control of the promoter and terminator sequences of the native SHE4 gene having met with no success. Such transient UNC45-GC overexpression could also restore a degree of viability to she4Δ cells at 45 °C (Fig. 4). UCS proteins are dedicated cochaperones that assist in the folding and the actin association of myosins (reviewed in (Lee et al. 2014; Ni and Odunuga 2015)). Mammalian cytokinesis, cell motility, and organelle trafficking are all dependent upon the formation of actomyosin complexes that require this UNC45-GC. Since these events are also apparent in the cytoskeletal dynamics of yeast cells, it is logical to expect that protein functions (including those of She4 and UNC45-GC) needed for these processes might be more conserved in evolution, as compared to functions involved in assembly of the contractile apparatus in striated muscle tissues (such as UNC45-SM). Consistent with this, our results provide an indication that UCS protein function has been most conserved—yeast to man—in the vertebrate UNC45-GC, not UNC45-SM. The apparent selectivity of UNC45-GC for the Hsp90β isoform of human cytosolic Hsp90, rather than Hsp90α (Chadli et al. 2008; Taipale et al. 2014) was not reproduced in this model in vivo yeast system. Probably, this is not surprising. Unlike vertebrates, yeast has just a single UCS protein, and there is no evidence for the almost identical isoforms of yeast cytosolic Hsp90 operating within separate chaperone complexes. The apparent stronger rescue of she4Δ phenotypes with a transient UNC45-GC overexpression in the yeast strain containing Hsp90α (Fig. 2), as compared to that with Hsp90β (Fig. 3) may merely relate to the somewhat greater functionality of the Hsp90α isoform of human Hsp90, compared to Hsp90β, as noted previously in yeast strains of this genetic background (Millson et al. 2007). We are indebted to Kathryn Ayscough for her advice concerning the use of FM4-64. S G E and J M were supported by a University of Sheffield Krebs Studentship and a University of Lincoln Life Sciences bursary respectively. Yeast heat survival studies were assisted by Bethany Auld while working as a University of Lincoln Life Sciences summer student.